Love Your Postcode are an award-winning estate & letting agent with a leading position within the traditional/online lettings and estate agency market. As seen on the BBC, our aim is to achieve the highest selling price within 21 days, leaving our home sellers with more money. We achieve this using years of experience, heaps of market knowledge, professional photography, assisted block viewings, unrivalled advertising and award-winning customer service. 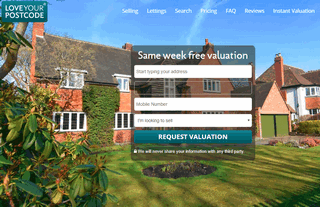 Contact us for a free property valuation.